CFS-MB chairperson Michael Barkman (left) with premier Greg Selinger (right) at an NDP campaign stop Monday. Photo by Craig Adolphe. 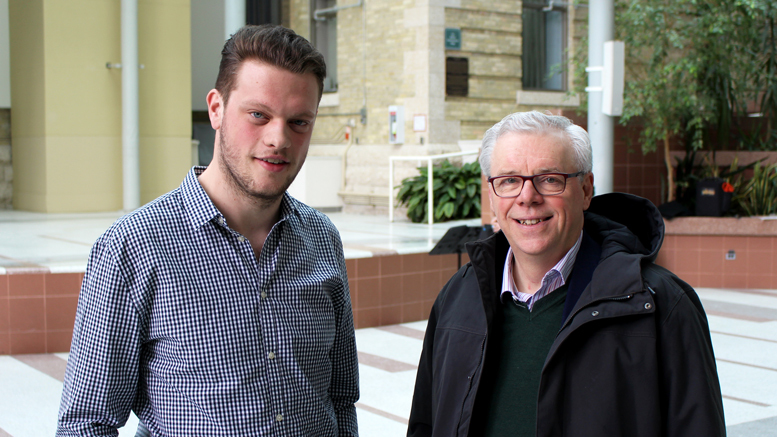 If re-elected April 19, the Manitoba NDP will offer non-repayable grants in place of student loans and provide free tuition to students in foster care up to age 25, leader Greg Selinger announced at an on-campus press conference Monday. “We want to make sure people not only have hope but a practical path to a better life and we all know that education is still the single best way to prepare yourself for the future,” Selinger said in an interview with the Manitoban. Selinger said converting student loans to grants builds on the NDP’s history of support for post-secondary education, which includes annual funding increases, caps on tuition increases, and most recently the elimination of interest on student loans. “Because of all these other supports we put in place it was the next logical move to build on that experience and try and keep post-secondary affordable for Manitobans who go to school here,” Selinger said. The grants are set to cost $40 million a year, compared to over $33 million a year for the current slate of student aid programs. The cost has been taken into account in the NDP’s budgeting forecasts, Selinger told the Manitoban. Grant amounts will be determined by the same criteria currently used for loans, and students who are currently receiving loans will still have to pay them back – though any future provincial student aid those same students receive will come in the form of grants. At the conference, Selinger also announced several more plans for post-secondary funding, including doubling funding for the Manitoba Scholarship and Bursary Initiative from $4.5 million to $9 million, launching a pilot program to prepare adult learners for post-secondary education or apprenticeships, and introducing $12 million for student family housing at Brandon University. The NDP’s plan will leave the tuition fee income tax rebate intact. Michael Barkman, chairperson of the Canadian Federation of Students-Manitoba, welcomed the announcement. 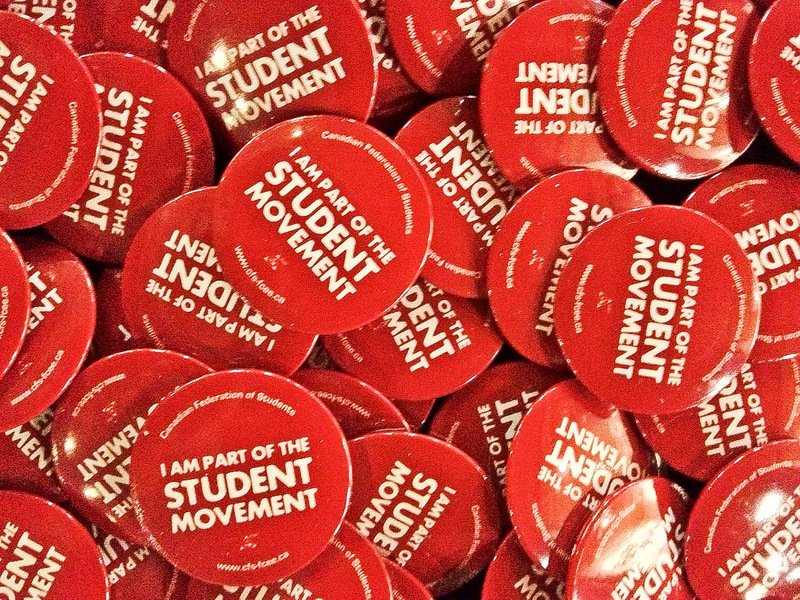 “It’s something that students have been asking for for a long time from all political parties,” he said. Barkman compared the NDP’s promise to the student aid programs in Newfoundland, where the Progressive Conservative government replaced student loans with grants last summer, and Ontario, which recently announced an initiative to provide non-repayable student aid to students from families earning less than $50,000 a year. “It’s an exciting step forward and it’s something we’re seeing across the country a lot of political parties committing to,” Barkman said. Allison Kilgour, a U of M student and a senate representative for the Arts Student Body Council, also praised the NDP’s student aid proposal. 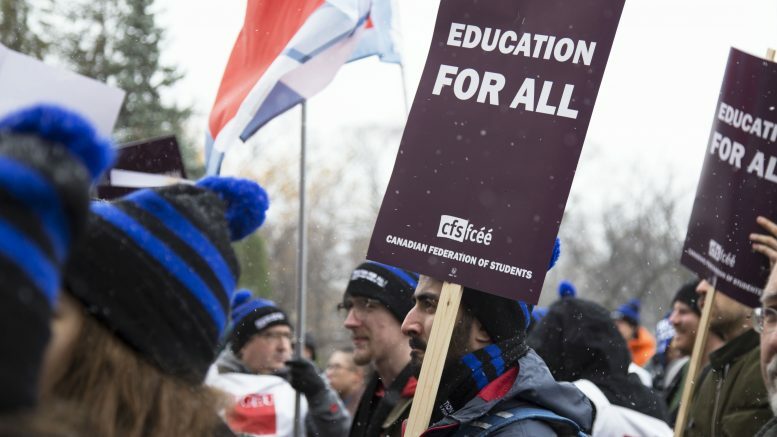 “We’ve seen the student debt rising higher and higher and we’ve seen other provinces take steps towards lowering the debt and turning it into grants,” said Kilgour. The Liberals promised in November to take the $10 million of Manitoba Student Aid money devoted to loans and convert it to non-repayable grants. They also vowed to eliminate the cap on how much money students can earn from working while in school. The Manitoba Progressive Conservatives, who are the frontrunners in provincial election polls, have not yet committed to a student aid plan, though they have cited their planned cut to the provincial sales tax as a way of putting money in the pockets of students and their parents. He also criticized the Liberal plan in a November interview, saying he doubts they will be able to follow through. “It sounds like a great promise but to me it’s sounding unrealistic and to me it sounds as if [Bokhari is] doing some vote-buying,” he said. Barkman compared the NDP’s proposal favourably to the Liberals’. Barkman said he is awaiting announcements on student aid from the remaining provincial parties.